Ann Garvin, PhD is the USA Today Bestselling author of “I Like You Just Fine When You’re Not Around,” “The Dog Year,” and “On Maggie’s Watch.” Ann writes about women who have a good sense of humor about doing too much in a world that asks too much of them. She is a professor of health psychology at the University of Wisconsin-Whitewater and a professor of writing at Miami University in the Masters of Fine Arts program. She is a sought-after speaker and has taught extensively in NY, San Francisco, LA, Boston and conferences across the country. 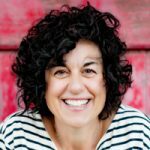 Ann is the founder and CEO of the “Tall Poppy Writers,” the largest female author marketing group in the country and co-founder of “The Fifth Semester” where she is committed to helping writers find their writing voice.